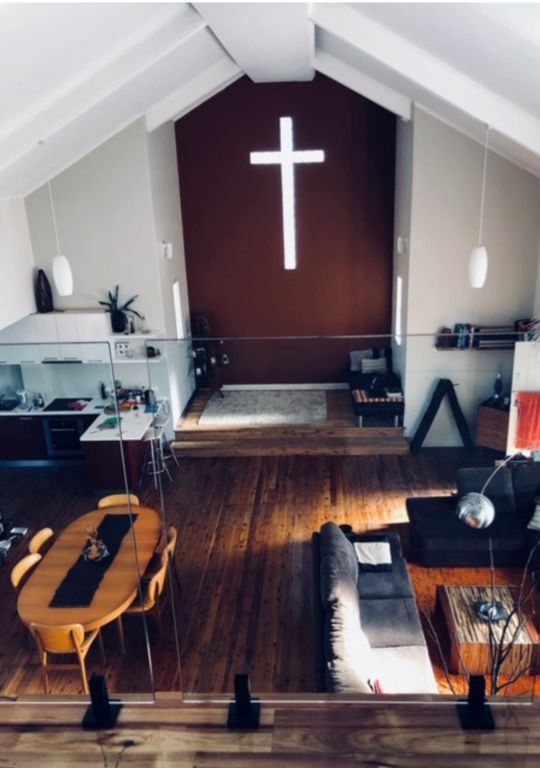 "The Church" is a renovated church conversion. It was built in the 1960's and served as a Lutheran church until 4 years ago. It has been meticulously renovated and has all modern conveniences while retaining it unique atmosphere. It is located in the quiet town of Yerong Creek just 30 minutes from Wagga Wagga and is a perfect place to base yourself for a weekend of relaxing, wine tasting, fishing and exploring all the NSW Riverina has to offer. Full bathroom with large bath, for those long soaks by candlelight! outdoor toilet and laundry room. Climb "the rock" its really good! Light a fire outside and drink some wine!! Even tho' this property is a bit out of the way, it is definitely worth it. We really enjoyed our stay. The Church is well equipped and just chock-full of great books and great items collected from the owners' travels. Very comfortable. Would be an even better stay for a family or a small group as the games area in the former school room is so much fun. The nearby shop only has basics such as juice, biscuits, milk so we were glad we had brought everything we needed food-wise. My family and I stayed for 3 days in early May and I have to say that the tranquillity and privacy was exemplary. There are novelties of an era gone by, toys for the kids, a games room that tells an amazing story through gadgets and pictures.It has it all there at your disposal. The open fire outside was just fantastic to sit around and mingle with all, the marshmallows went well even with the BIG kids! The care taker and his wife were absolutely fabulous, so friendly and helpful. I had forgotten my reading glasses behind and on contacting the owner a week later they were mailed out to me immediately and arrived within two days. I have to say that you just don't get this in my experience of travelling. Well done to you and thank you for an amazing time. I would most certainly recommend this home and if I need to travel there again this is where I will be staying. Fantastic facilities, great for kids, lovely area, close to Wagga. Will be returning frequently when it is available. Thank you. WOW!! Words cant fully describe this wonderful property. Everything needed for a 7 night stay, books games and toys, the list goes on. An extremly well kept and comfortable property. Local bowling club is a must for dinner on Sunday evening, we enjoyed the warmth of the locals and had lots of laughs. The games room was great fun. I cant reccommend this property highly enough. Great for adults and kids. Thank you Nick and Danuta and also Fernando and his wife, the caretakers. A truly unique experience...The moment the four of us entered the property, we felt like kids in a candy store. We all marveled at the interior of the Church and all the toys it provides! Pool table, cocktail bar, iPod dock, fire pit, laser lights, and the list goes on.Toys aside, it also has all the essentials for cooking, linen is included, and heating works really well . Our bed was so comfortable, I had to check the brand before we left!The locals are extremely friendly and the bowling club is a great place to meet people, have a beer and order a meal during the weekend. They even deliver pizzas (weekends only)!. The owners Nick and Danuta as well as the "caretaker" Fernando are a pleasure to deal with.Perfect couple's retreat or bring a few friends to share this truly unique, FUN place.